Decorating Your Child's Bedroom? Here Are Some Great Tips! Home Project Advice Renovations Bedroom Decorating a Child’s Bedroom? Here’s Some Great Tips! Remember to consider your child’s special interests and personality when planning the bedroom decor. Attention to detail helps make the bedroom uniquely suited to your child. A child who likes rugby, sea creatures or Batman, would love design elements that reflect these interests. Involve your son or daughter in the design and planning process as much as possible and appropriate for his age. This makes for a great bonding experience! 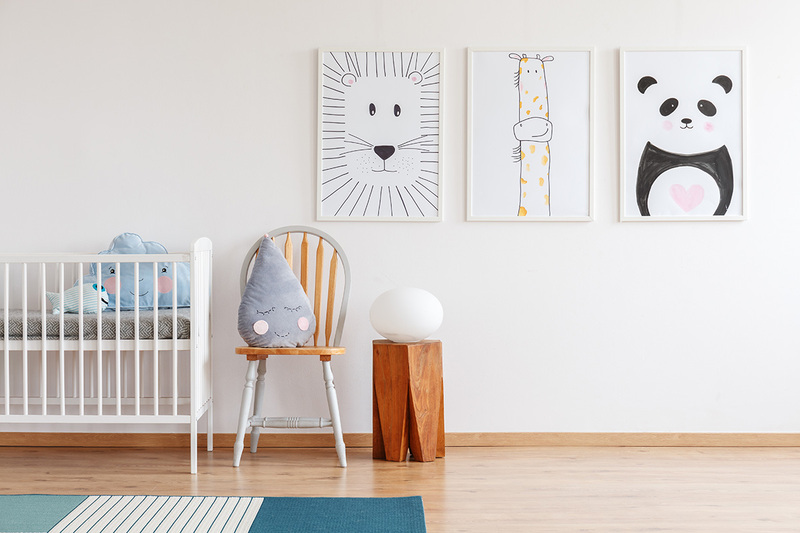 Builderscrack have some tips for success when decorating your child’s bedroom, but if you are unsure where to start hire a decorator or colour consultant to help! 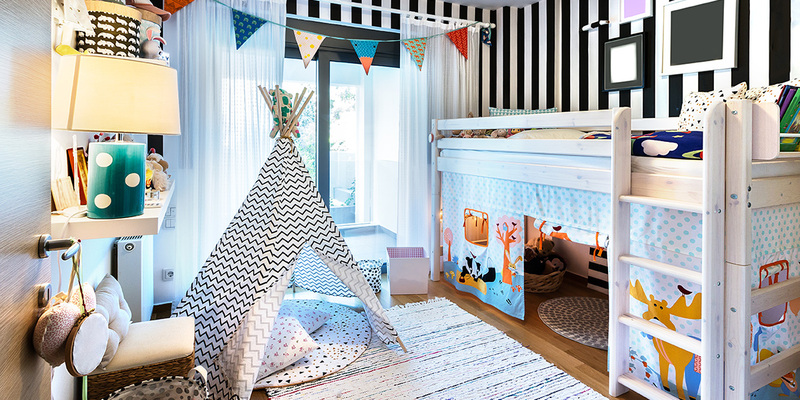 Decorating your child’s bedroom can seem daunting. Here are five tips to make it easier for you. Floor space can be increased by using innovative storage options. Brightly coloured boxes and crates are a great idea when stacked or attached to the wall. Kids may also like an elevated bed with workspace or storage room underneath. 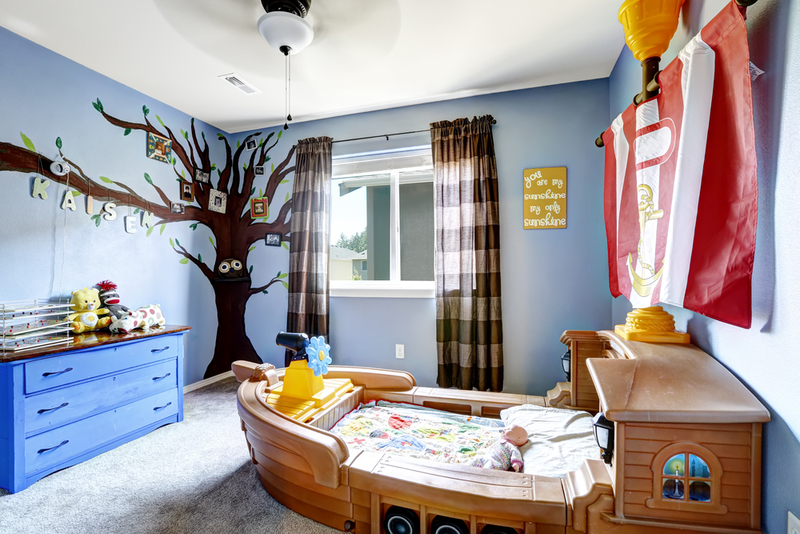 Incorporate some work space into the plan when decorating a boy’s room. A desk or project table often becomes one of your child’s favourite areas in their bedroom to spend time. It can be useful for both homework and hobbies. It is best to think long-term when decorating. This is because it may need to be redone several times as your child grows up. 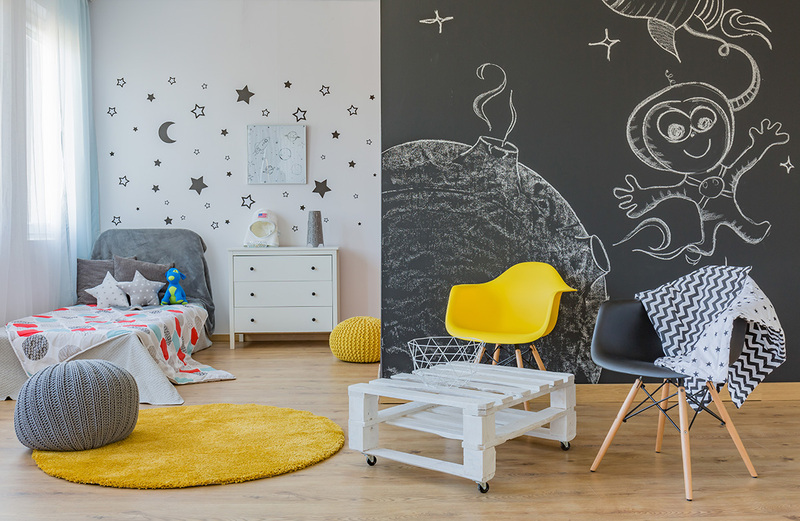 If the plan is to make the room playful while your child is a toddler or in primary school, choose paint and flooring that will allow these items to remain the same even as the room is redecorated to reflect your child growing up. Wall murals, rugs, curtains and bedding can all be changed quickly, inexpensively and without much interruption to daily life. 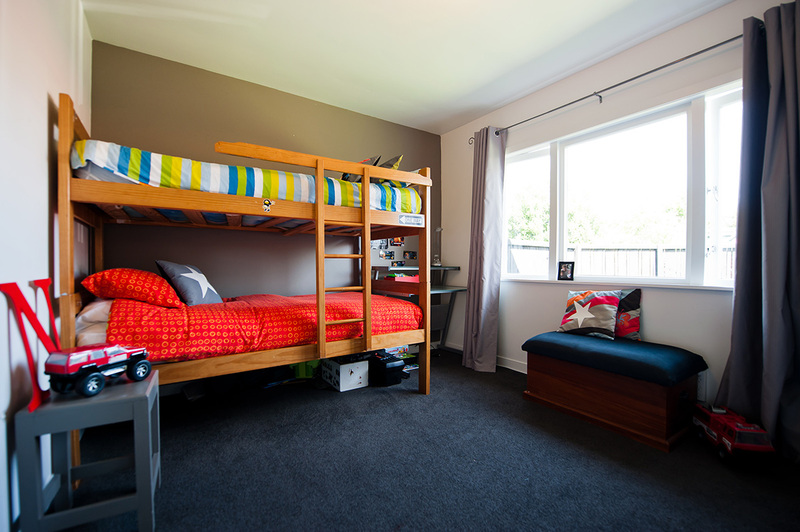 Bunks are a great way of creating more space in a room. 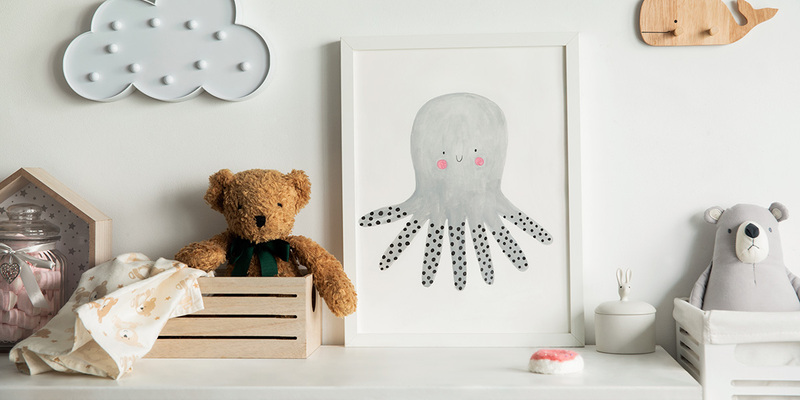 Themes that work well in boy bedrooms include superheros, cars and trains, wild jungle animals, All Blacks or Warriors and other New Zealand sport teams, animals, sea creatures and nautical ideas, space and insects. Depending on your budget, you could get really creative or keep the decor sedate and simple. Use paint in a variety of creative ways and don’t be afraid to use a neutral background colour, adding accents of a brighter shade for effect. Use a base paint colour on the wall first. Then add wall murals or decals (stickers) to pick up the theme of the room. Painting a section of wall in chalk paint is a great way to give your child a place to explore their creative skills. A rug on the floor is a great way to enhance a bedroom theme. If you have chosen a transportation theme, there are rugs available that have roads and train tracks, which would allow your son or daughter to run his or her toy cars and trains over the rug when playing. A jungle theme may include a rug that has a variety of animals on a bright background. The best furniture for your child’s bedroom will depend upon his age and the space available. Sturdy furniture is recommended. Accessorizing the bed can be a great way to incorporate the bed into the bedroom theme, but remember not to overdo fluffy pillows and soft toys that may end up on the floor more often than the bed! A car bed frame, however, would be a great in a transportation or cars themed bedroom along with a matching dresser, desk and chair. The pictures on your child’s bedroom walls will enhance the overall theme when decorating your child’s bedroom. Shelves can be mounted on the wall and filled with toys that fit the theme. Curtains can add to the theme as well as bedding. Spend time and effort involving your child when decorating, and you will definitely create a space he’ll enjoy spending time in. A bedroom is a spot where your son or daughter can play alone or with friends and siblings, relax and spend time rejuvenating for the next day. Kids need this special space as much as adults need it. If you want to get a back of the envelope of what this might cost, check out our free online cost estimator.